DETROIT (Reuters) -- Detroit's automakers, on track for their best sales year since 2006, may want to brace themselves for rockier times ahead. Auto executives say the industry is as healthy as it's been since being restructured in 2009. But judging by the recent stock performance of General Motors, Ford Motor Co. and Fiat Chrysler Automobiles, investors have a less robust view. Over the past year, GM and Ford share prices have lagged the overall market, in spite of moves by those two companies to give more cash back to shareholders. Fiat Chrysler prices plunged last week as CEO Sergio Marchionne made increasingly overt efforts to drum up interest in a merger with one of his rivals. "The party may be starting to wind down," said Charles Chesbrough, senior principal economist for IHS Automotive. "We're still looking at a good couple years of strong demand, but the days of big sales increases are behind us." Optimists include Kurt McNeil, head of GM's U.S. sales operations, who said Friday that the industry is on track to have its best sales year since 2006. U.S. sales of cars and light trucks are estimated to reach 17 million in 2015, compared with about 10 million in 2009. U.S. consumer confidence is up, house prices are recovering and gasoline costs less than $4 a gallon in most parts of the country, supporting sales of the big trucks and SUVs that drive profits for the Detroit 3, just as they did before the financial crisis crash in 2008-09. But there are warning signals. 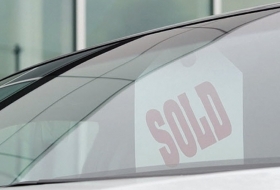 Sales growth is slowing in the home market, demand for small cars and family sedans is falling, revenues have declined, profits outside North America and China are virtually nonexistent and share prices have flattened. All three Detroit automakers missed analysts' expectations for first-quarter earnings. After reporting healthy April U.S. car sales on Friday, stocks fell again at all three. U.S. sales growth this year has slowed to 5.4 percent from double digits in 2010-12. As demand slows, and more companies add production capacity in North America, competition from Asian and European rivals using cheap currencies will intensify. GM's share of the North American market in the first quarter slipped to 16.4 percent in the first quarter from 16.5 percent a year earlier. "Over the next couple years, we expect to see the industry cycle down -- not next year, but 2017," said John Hoffecker, managing director and global vice chairman of operations at AlixPartners. Detroit automakers have had "a good strong, long run," but "there will be a correction from where we are today." Before the next downturn, the U.S. carmakers "need to find long-term solutions to sustainable profitability and cost competitiveness," said Xavier Mosquet, global automotive practice leader for the Boston Consulting Group. "That may be their biggest challenge." Part of that solution may be to reduce their dependence on the U.S. market. The companies need to reduce excess production capacity overseas, especially in Europe and South America, said Matthew Stover, auto analyst with Susquehanna Financial Group. And as U.S. demand slows, they need to generate a higher return on their overseas investments. Ford and GM are losing money in Europe even after restructuring efforts that included plant shutdowns. GM has said it expects to return to profitability in Europe in 2016. In Latin America, GM and Ford are losing money as the Brazilian economy slows and economic turmoil wracks Venezuela, where Ford earlier this year took an $800 million pretax writedown. GM has signaled it could stop Venezuelan production in July. In China, GM's profit margins fell to 9.9 percent in the first quarter from 11.2 percent a year earlier. "GM and Ford earn terrific rates of return in North America, but they're getting killed in Europe and South America," Stover said.